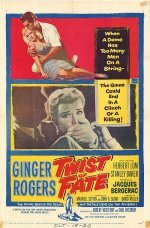 Ginger Rogers, moving inexorably towards her sell-by date, stars in this British-made thriller set on the French Riviera and directed by David Miller. She plays a woman who, let down by her wealthy and married racketeer lover (Stanley Baker), contemplates killing herself but, instead, hooks up with a Frenchman (Jacques Bergerac) and finds herself implicated in murder. This is a labyrinthine, depressing and unconvincing melodrama, although the always interestingly suave Herbert Lom makes a welcome appearance in a supporting role.